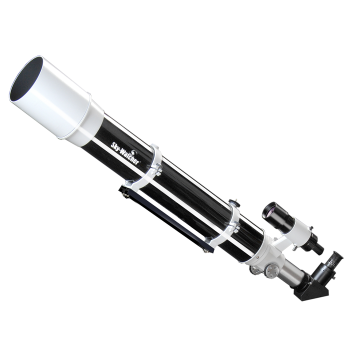 This telescope provides powerful optics and high resolution, making it ideal for detailed planetary observing. Its 120mm aperture makes this achromatic refractor one of the larger examples of this type of amateur telescope design. The aperture ratio of f8.3 means most chromatic aberration has been well corrected. The telescope is a refractor and so provides a high contrast image - essential for observing the planets. The most important thing when observing planets is being able to see the individual details, such as the polar ice caps on Mars or the Great Red Spot on Jupiter. With this telescope, there is nothing standing in the way of you taking a tour through the solar system. Many deep-sky objects, such as the Ring Nebula or the distant globular cluster M13, can also be seen. With 293X more light gathering capacity than the naked eye alone, it can show objects that cannot even be seen without optical assistance. The telescope collects 44% more light than a 100mm telescope. It comes with a 2" focuser which includes a 1.25" reducing adapter, meaning both sizes of the eyepiece may be used. A 2" eyepiece lets you achieve the widest possible field of view. So, for example, a 40mm 2" eyepiece with 72° apparent field of view lets you observe 2.8 degrees of the night sky. Consequently, extended deep sky objects will fit well into the field of view. The finder scope provided is mounted parallel to the main telescope tube and is indispensable when for first locate objects. 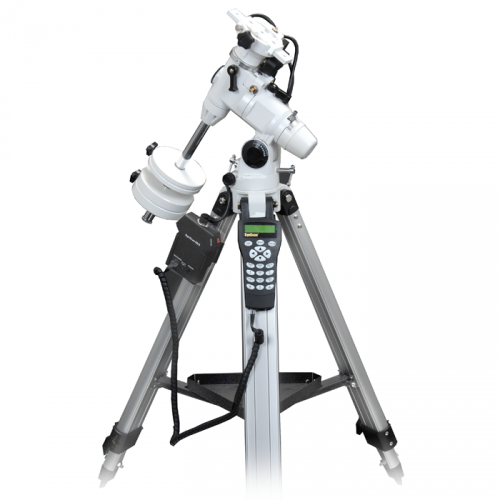 Astrophotography can also be done with this telescope: The Moon, planets, and even the most nebulae can be photographed using it. The OTA is also visually a real gem and looks simply stunning. It features an elegant design for the both OTA and finder scope in an aesthetically pleasing shimmering black metallic effect. This mount is a further development of the EQ-3 mount designed in white. It provides a stable base for most medium-sized optics and is ideal for exploring the night sky. Once you have aligned the parallactic mount with the Pole Star, you can easily sight on an object, adjust it in the field of view and track it using the flexible slow-motion. Fine adjustment is possible in both right ascension and declination. The polar elevation at the observing site can be set using the fine scale provided and adjusted perfectly by using two screws. Both polar finder and electric motors plus a control can be retrofitted to both axes: the NEQ-3 is suitable not only for visual observing but also for getting started in astrophotography. With optional add-ons such as the motor kit or GoTo upgrade kit, long exposure astrophotography also becomes possible. With a little practice, you will soon be able to produce successful images of galaxies and nebulae.